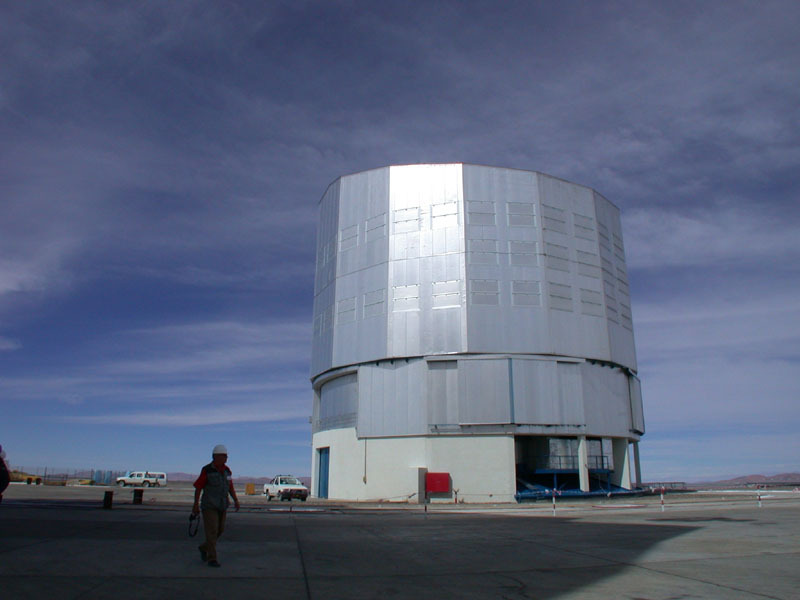 VLT will be soon the largest telescope ever built in the world. 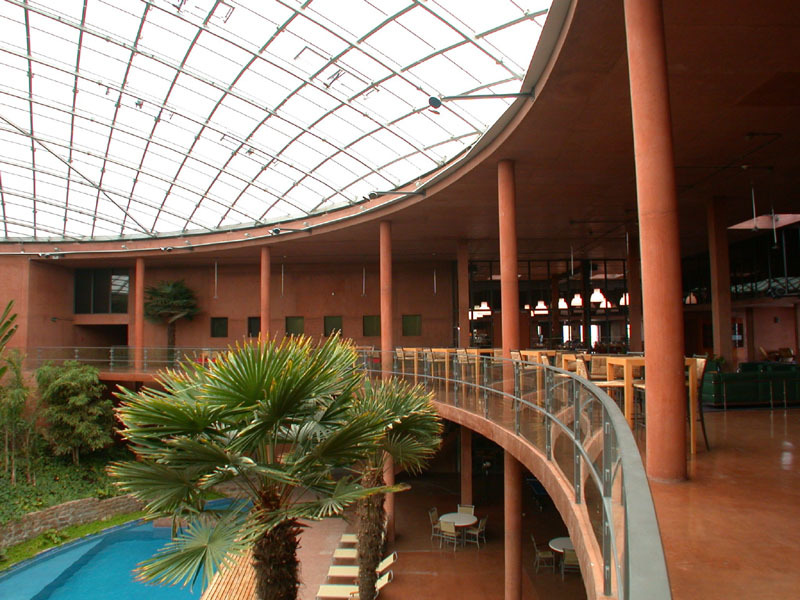 It is composed from four telescopes with mirrors made from one segment, each of 8.2 meters in diameter. 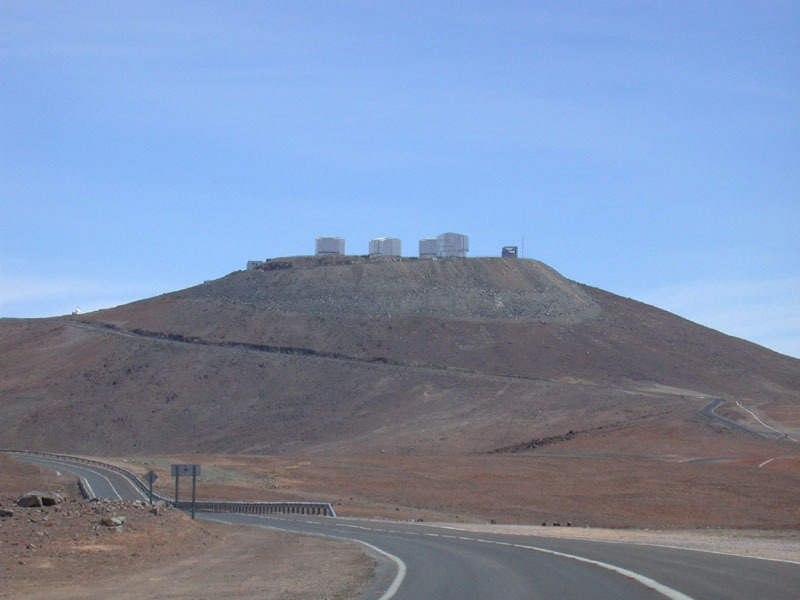 Next year, these telescopes will be cooperating as interferometer with 200 m base. 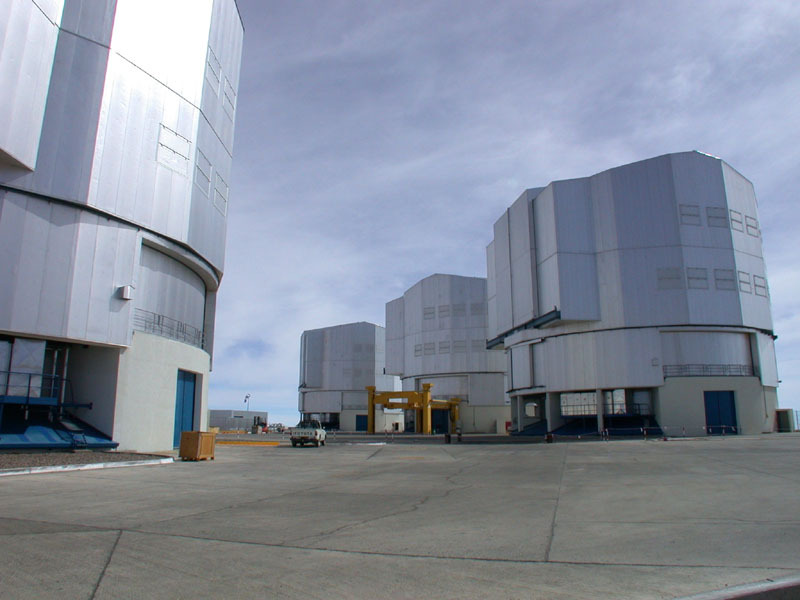 To the four main telescopes will be added three 1.8 meter telescopes, one 2.5 meter instrument (VISTA) and one 4 meter (VST). Finishing of the telescope construction is supposed in year 2005. 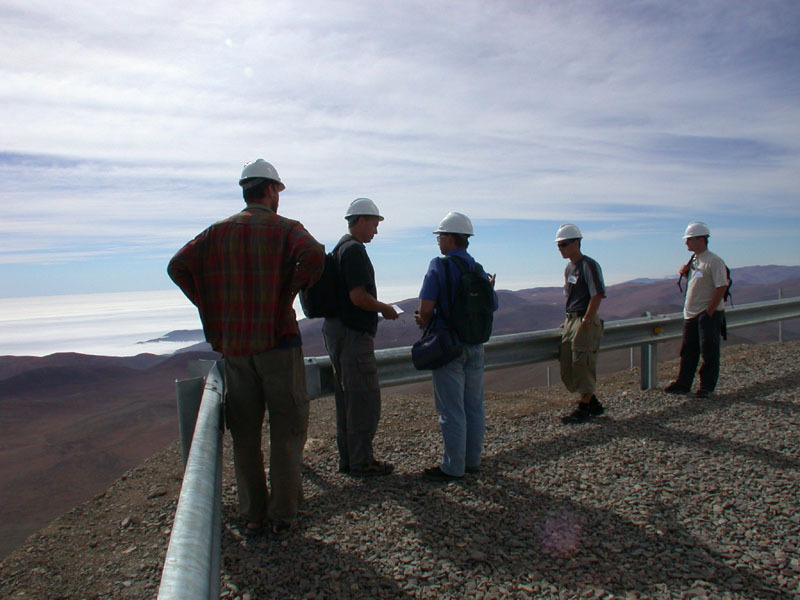 The telescopes are built at the most dry place on the Earth, at the Atacama desert (Chile), at the altitude 2 600 m above sea level. 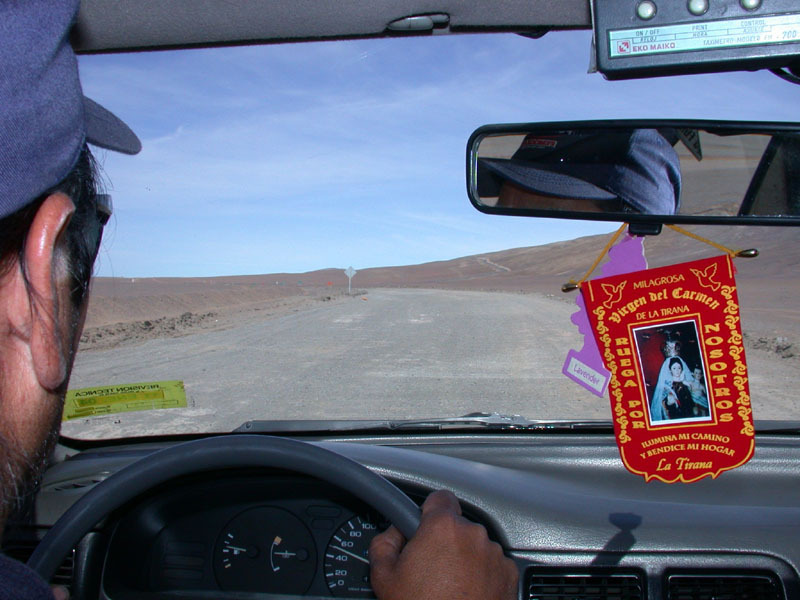 The way from Antofagasta to VLT. We leased two taxi cars of total cost 150 000 pesos (about 230 USD). 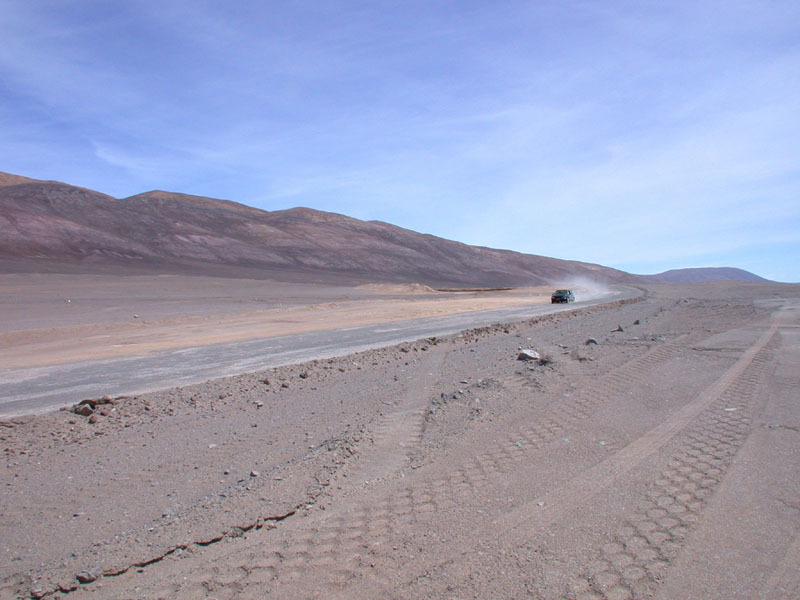 The way drives through the Atacama desert, which is the driest place on the Earth. The rain has not there been observed last 400 years. 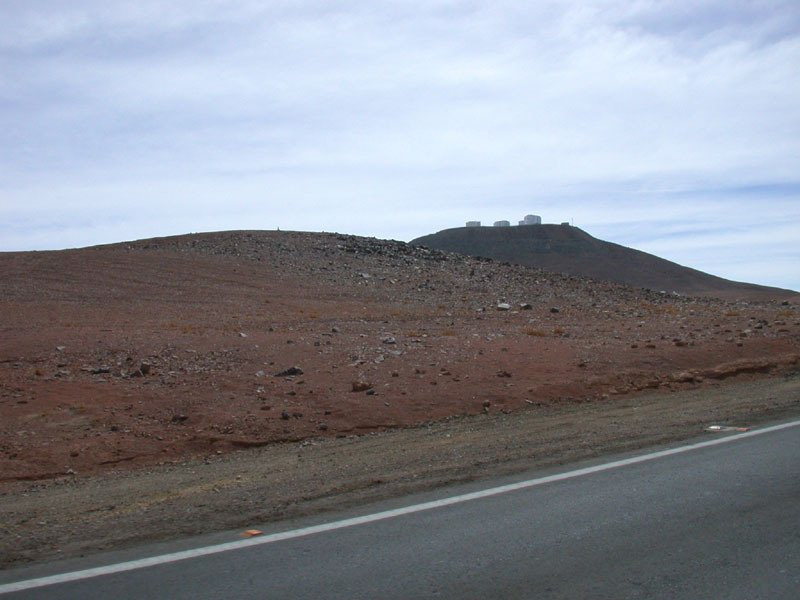 To the VLT our driver went very carefully, but on the way back we have prayed for the safe finish. 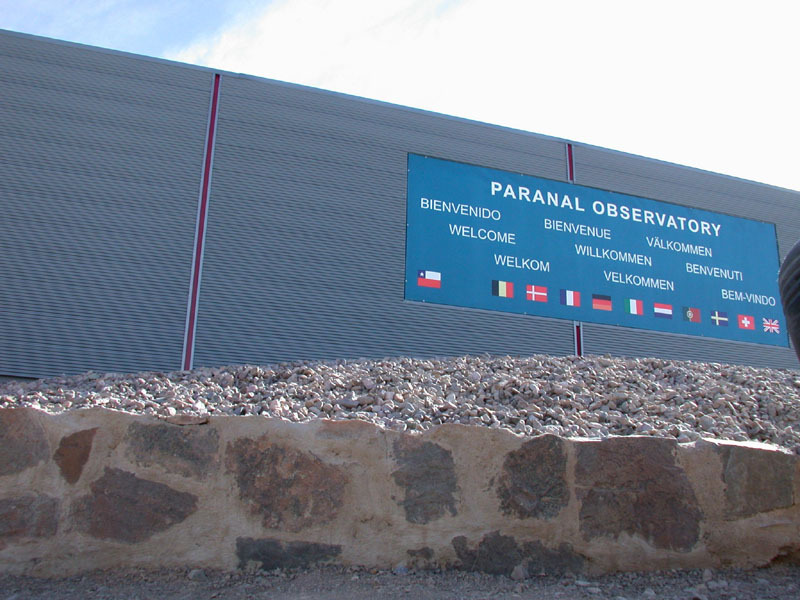 Tightly under Cerro Paranal mountain begins area of European Southern Observatory (ESO). Dusty road changes to good one, with safety band on both sides. 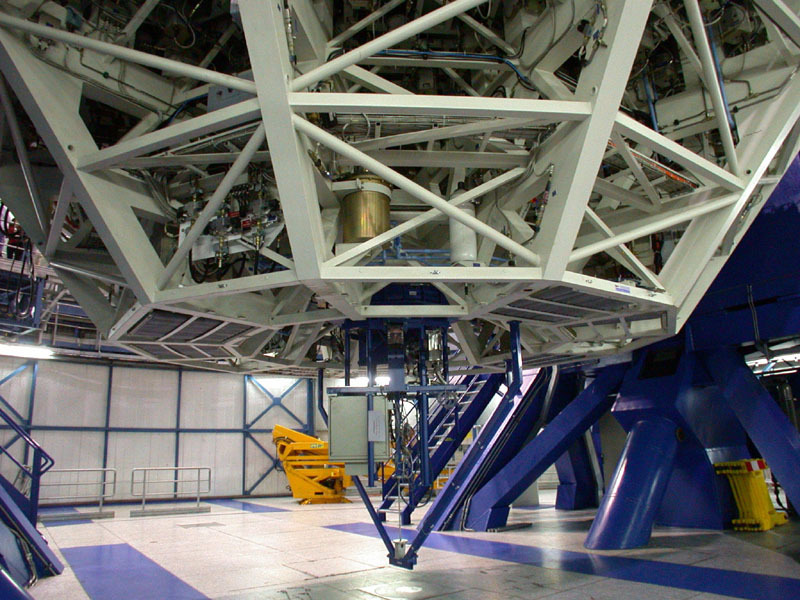 The first look at VLT – the largest telescope in the world. 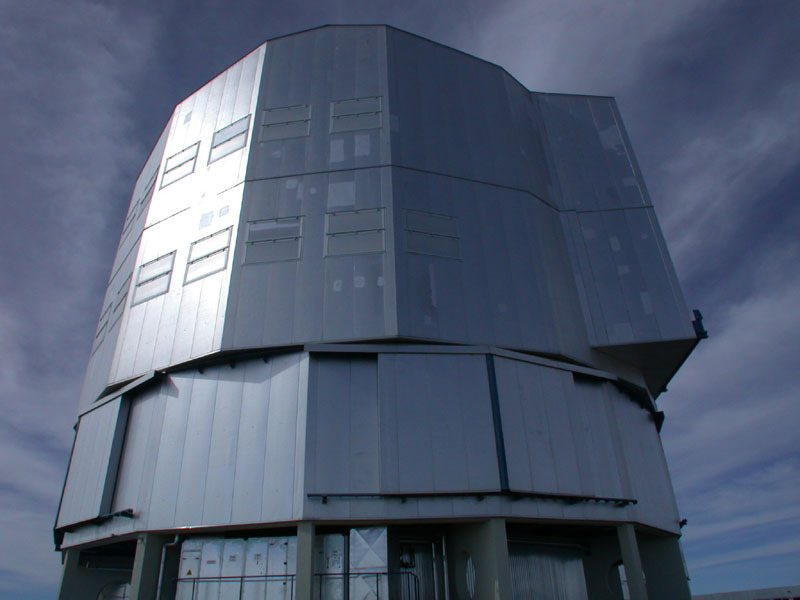 It is composed from four 8.2 meter telescopes with mirrors made from one piece. 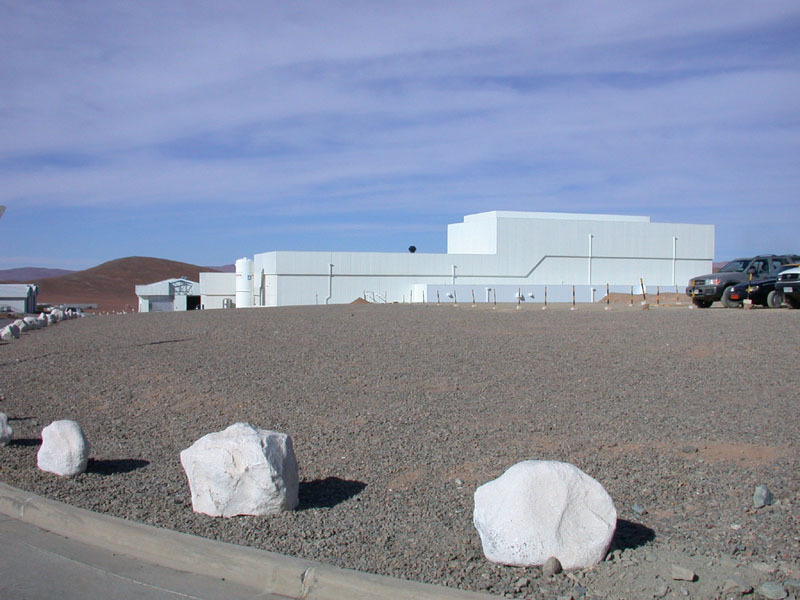 White building under the mountain is giant vacuum chamber, where the mirrors are plated with new metallic surface each 18 months, due to the damage by dust. 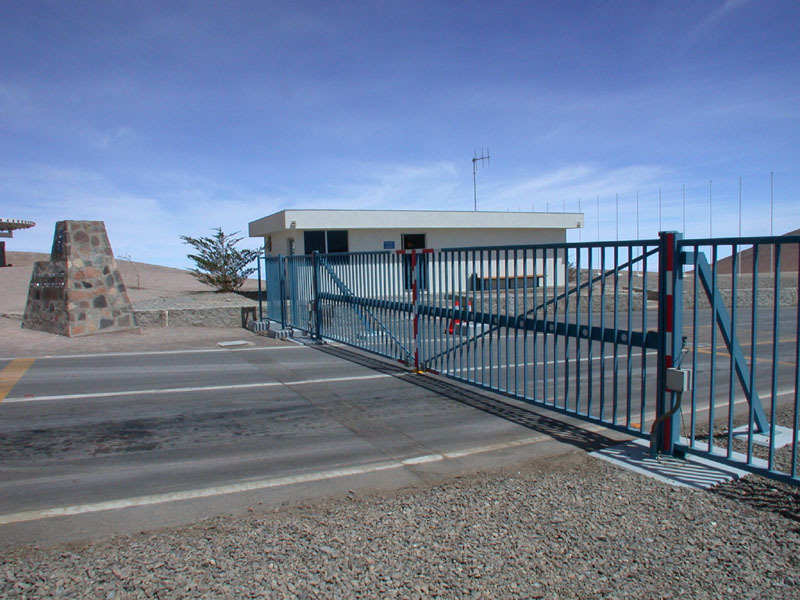 Arrival to the gate of the observatory. Next way is possible only with a special permit. Tourist visitors can go there only one time per month. 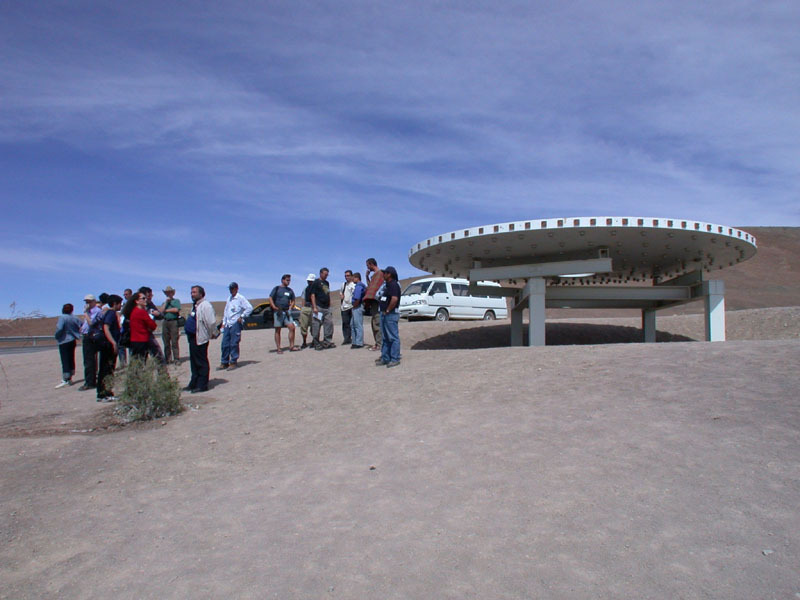 Visitors in front of the model of mirror pad. 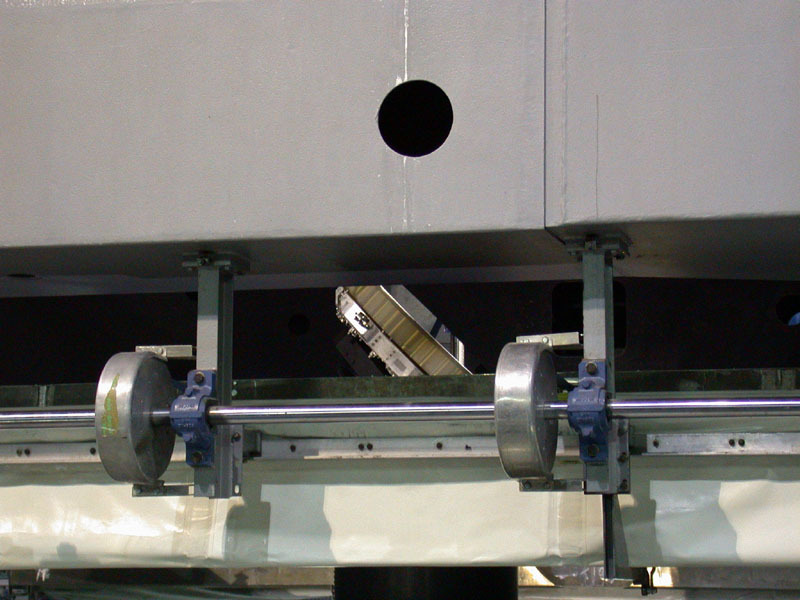 On the bottom there are holes for hydraulic pistons, which are adjusting the shape of mirror (active optics). First look at close range. 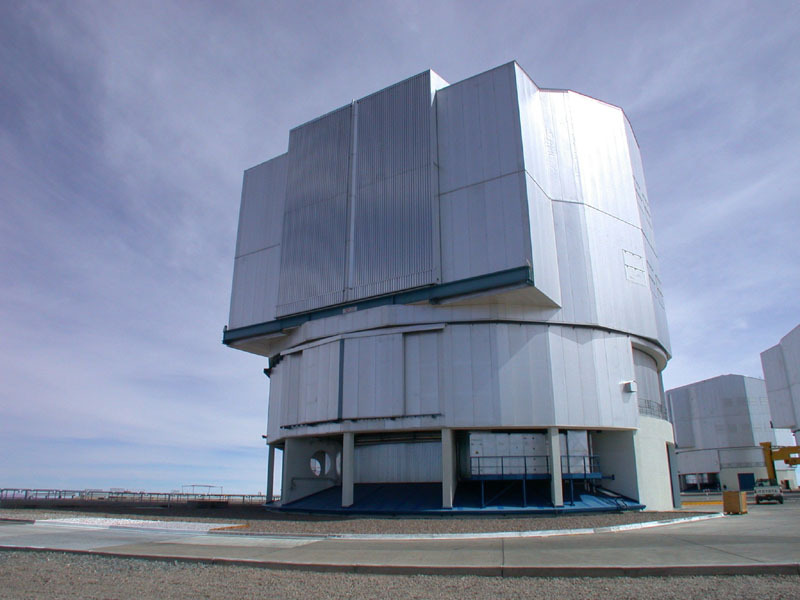 One of four telescopes. 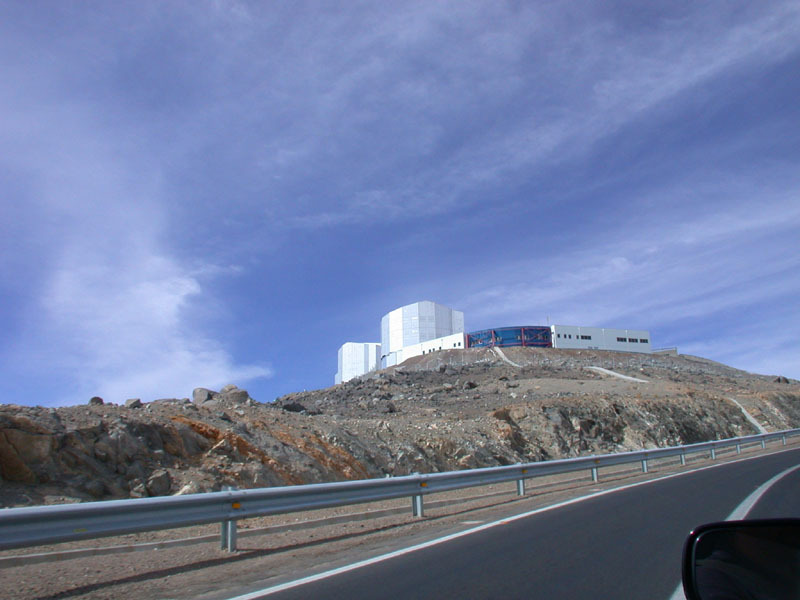 Buildings of all four telescopes. 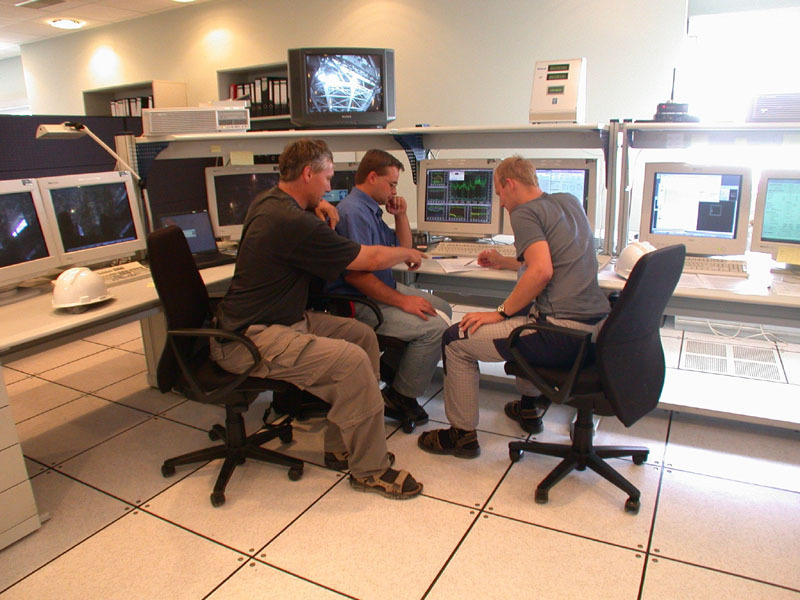 The telescopes can work separately, but combined interferometer mode will be available soon. 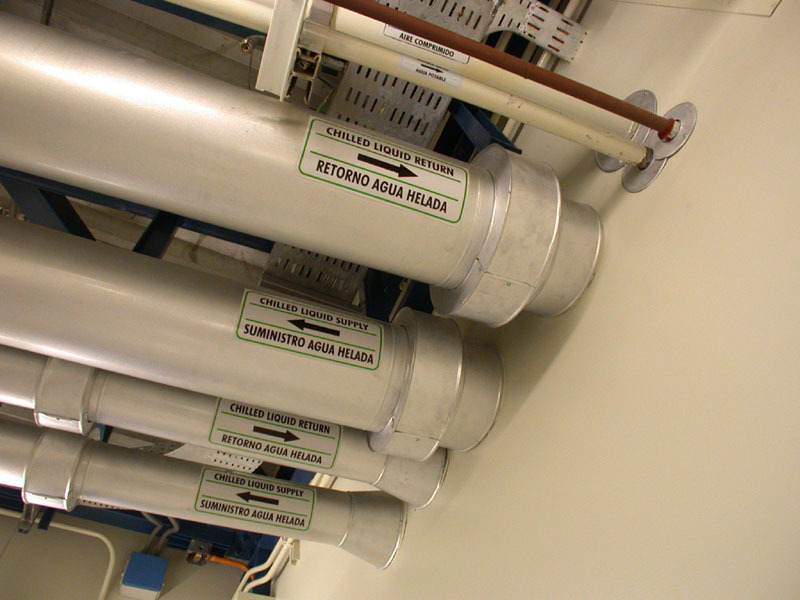 Closed testing apertures to the underground interferometer. 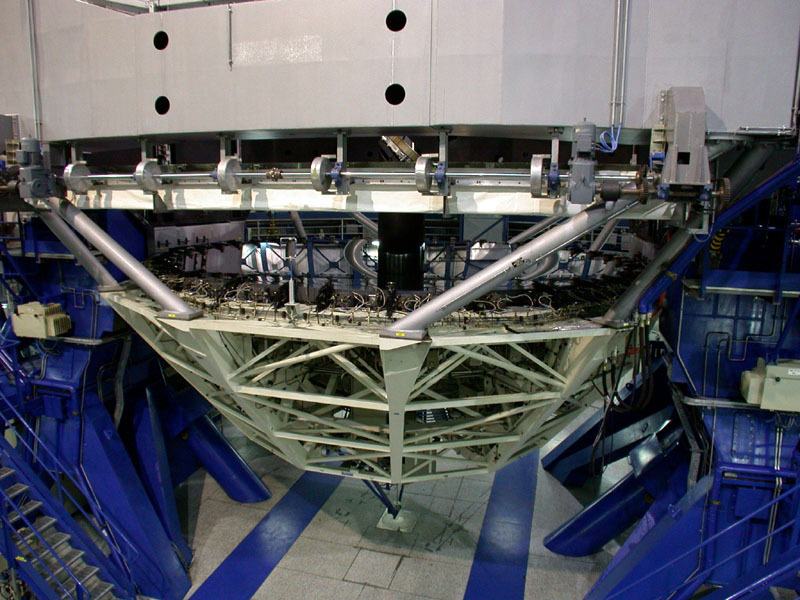 Dome of one telescope. Detailed look to the housing with blow-holes, which can help stabilize the temperature inside. You can see the clouds, but after sunset they will disappear. 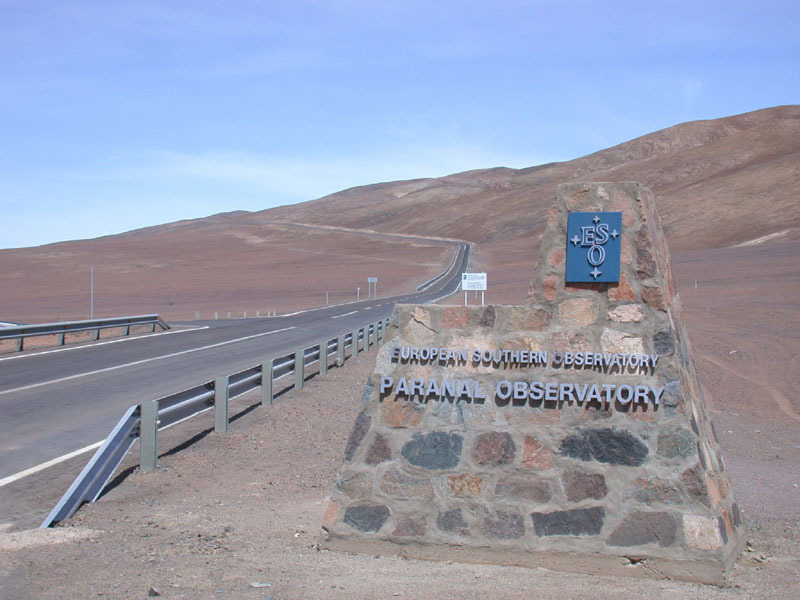 During year, there are 350 clear nights. 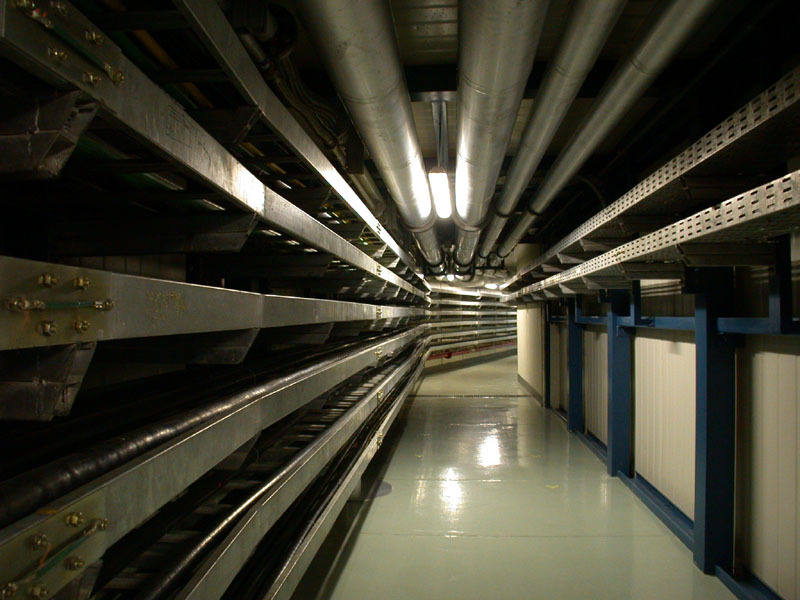 Air-condition at unit 2. 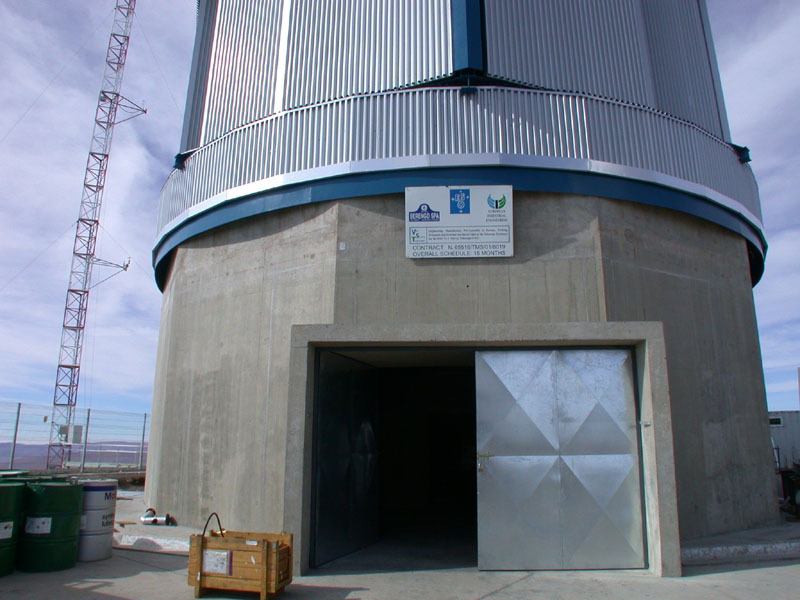 The whole day the temperature is regulated to night value, so there will not be any atmospheric turbulences after dome opening. 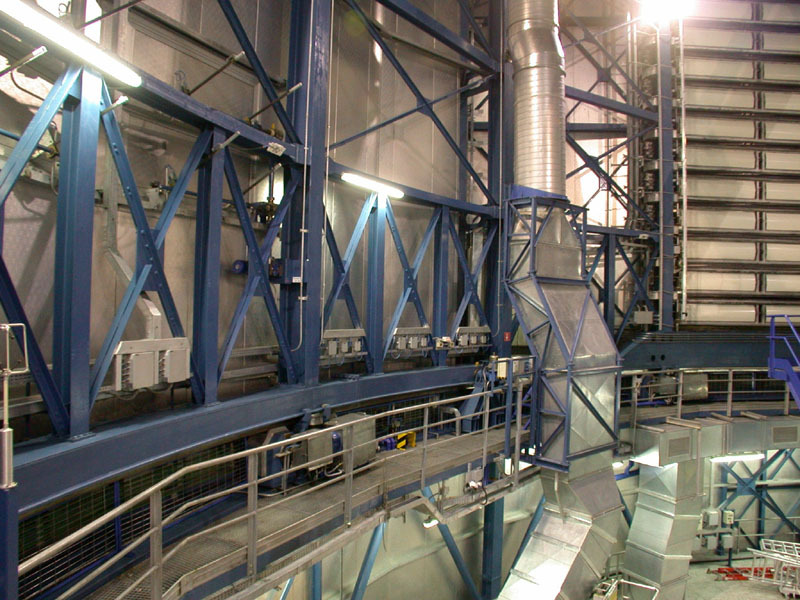 The cooling liquid flows to the dome from distant control center. 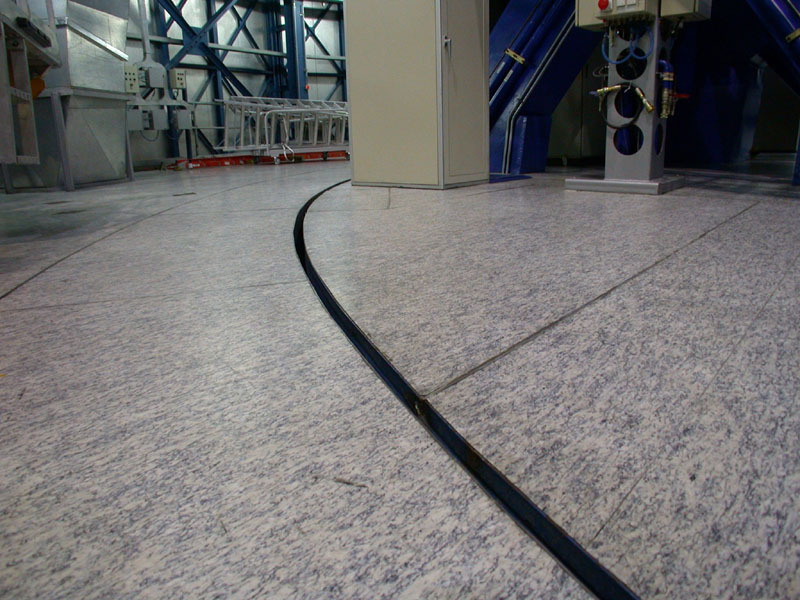 The telescope stands on the concrete base, which is separated from other parts of the building. 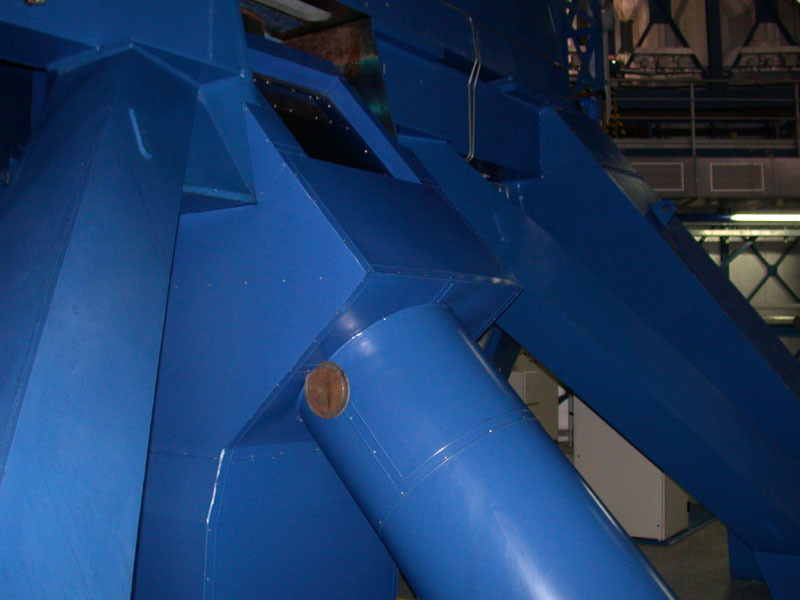 The detailed look at rift separating the telescope and the rest of the construction. 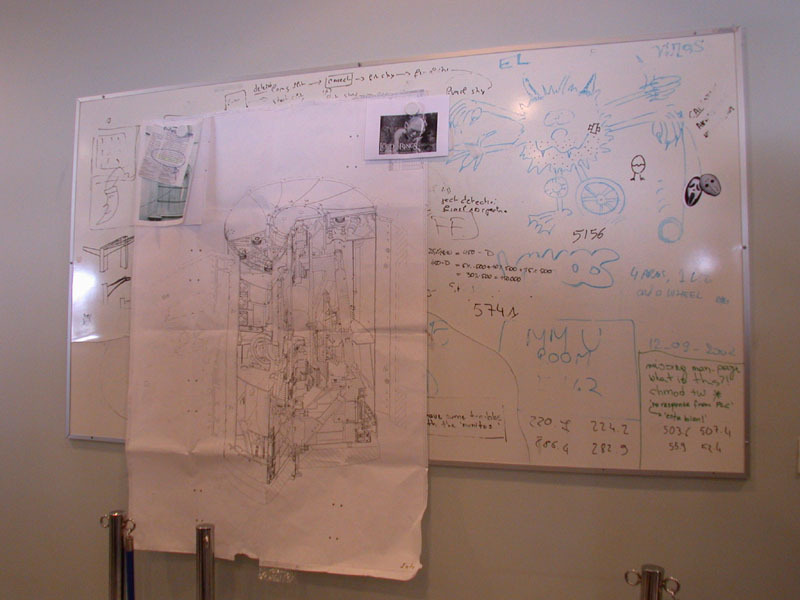 Detailed look at the dome wall. Under the telescope. 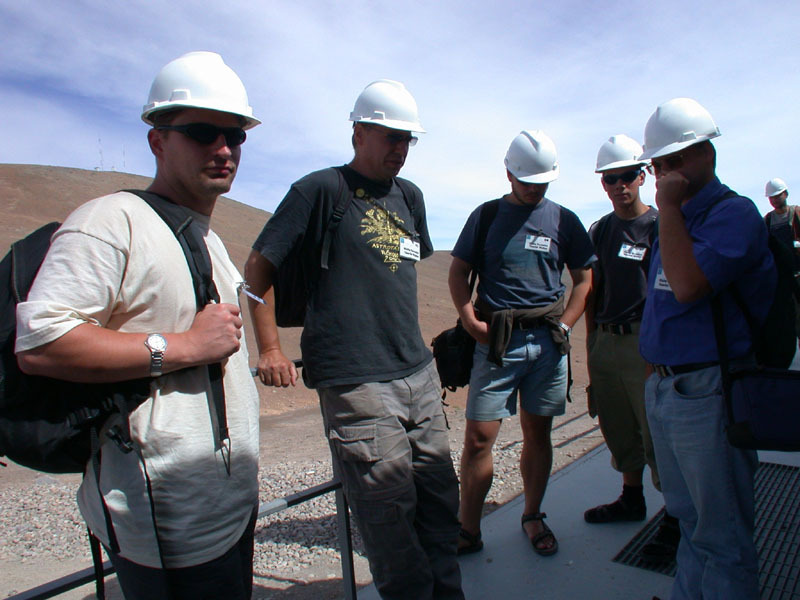 The whole expedition under the telescope Kuyen (second from four telescopes, operating from 2000). The view from above. 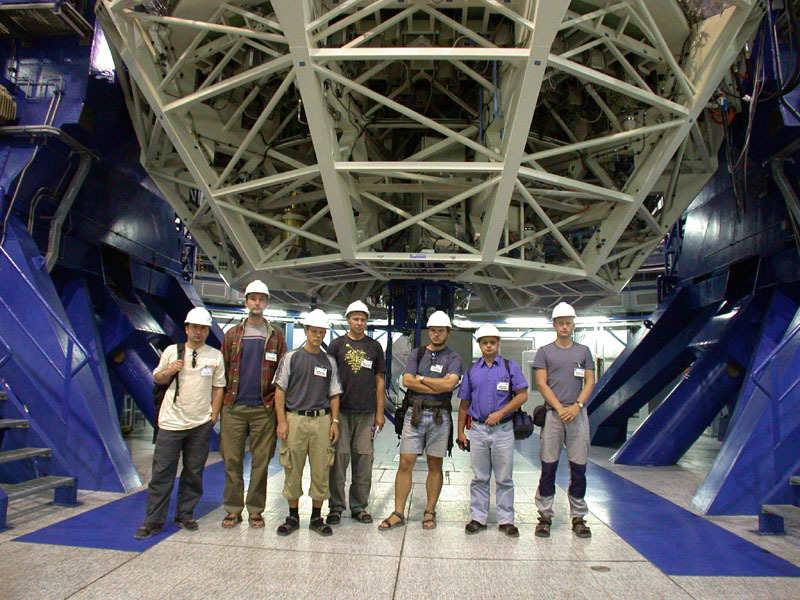 Diameter of the mirror is 8.2 meters. It was made in Germany and sanded in France. 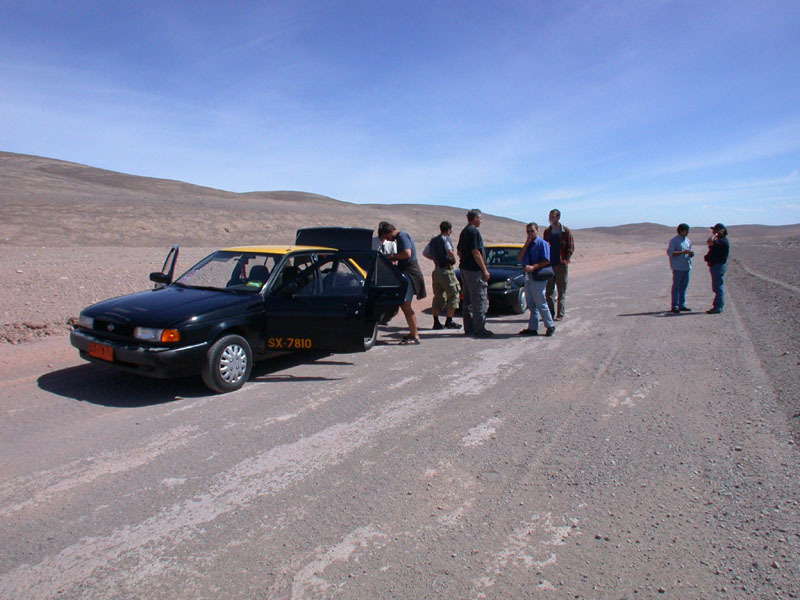 Transport from Antofagasta (120 km) lasted three days with average speed of 4 km/h. Close view to the mirror, thickness 18 cm. In front you can see the anemometer for wind speed measuring. 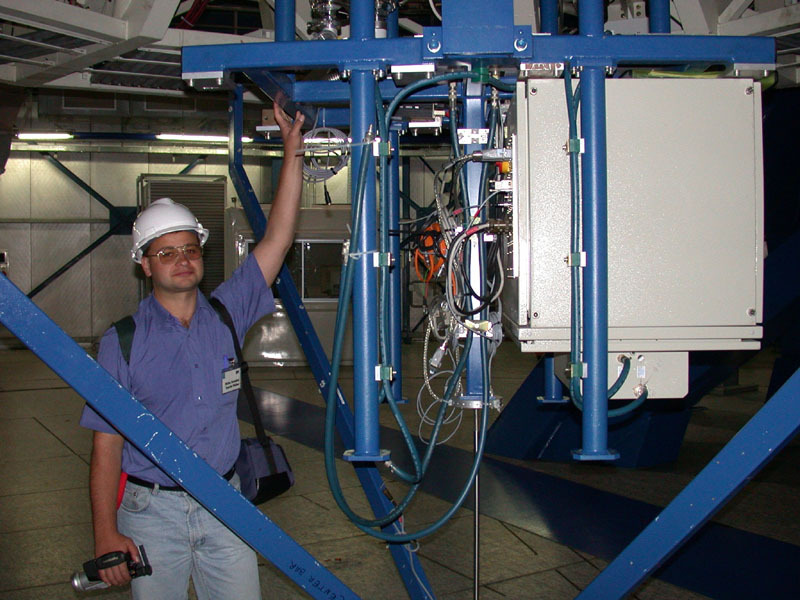 Above the center tertiary mirror is visible , which reflects light beams to the desired instrument (UV, V, IR). We are looking at the ocean, located in distance 12 km from us. 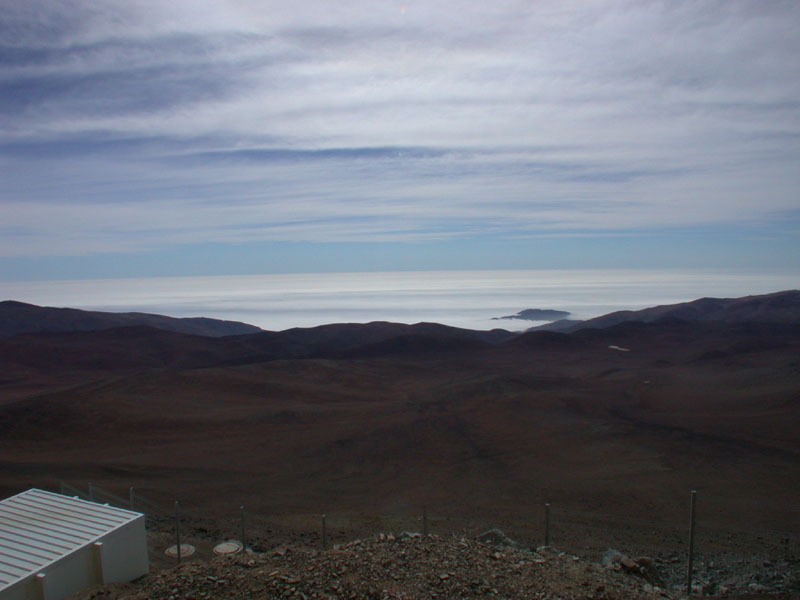 Cold Humboldt´s current stabilizes layer of clouds in the altitude under 1 kilometer. And one more look at the distant ocean. 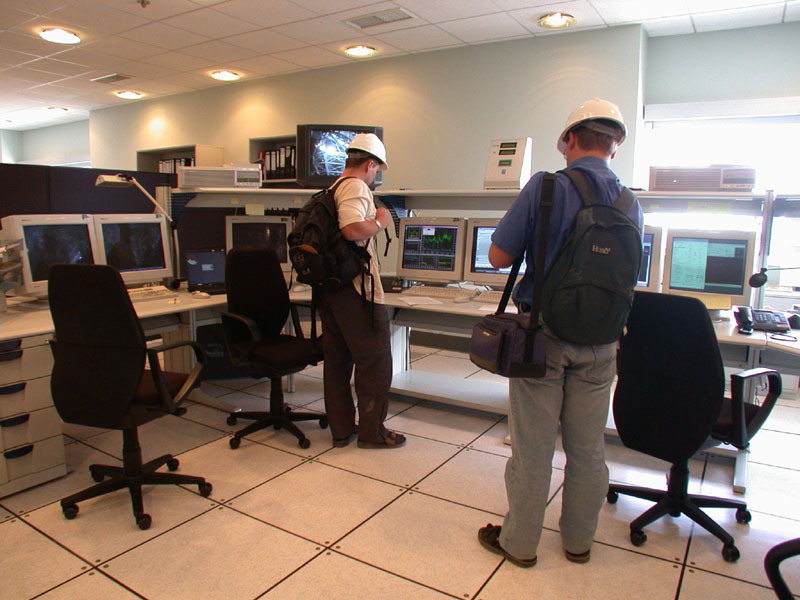 Every unit has its control center, this is control center of Unit 2 (Kuyen), the telescope which we have seen. 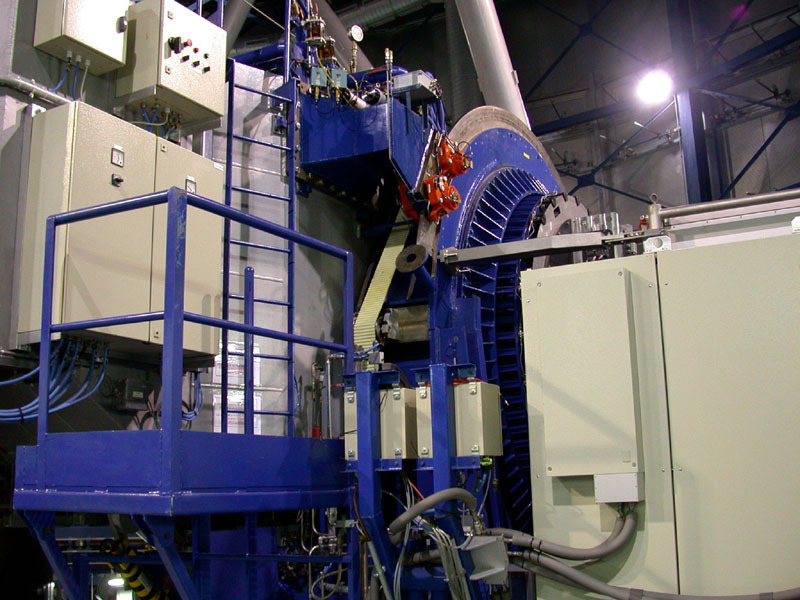 And in this way the telescope can be controlled. Scientific notice board and blackboard together. Here comes to existence fundamental astrophysical ideas. 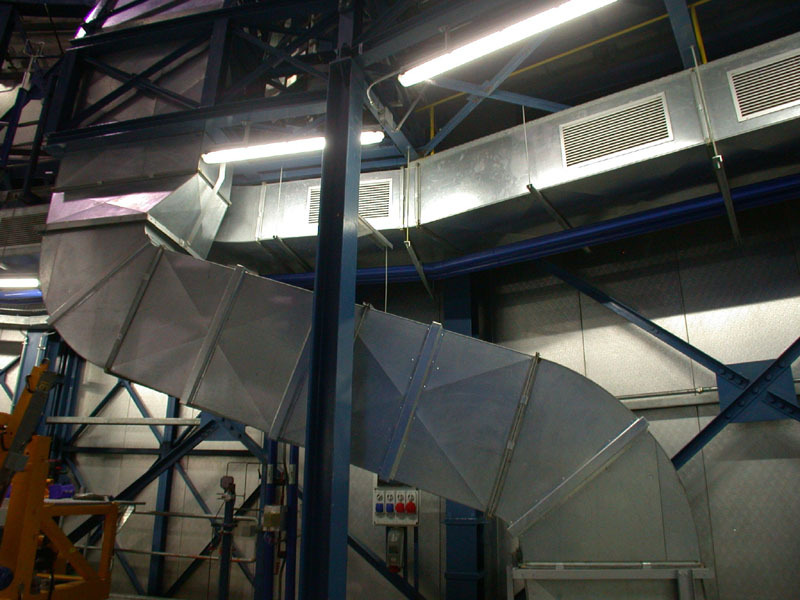 British telescope VST under construction. 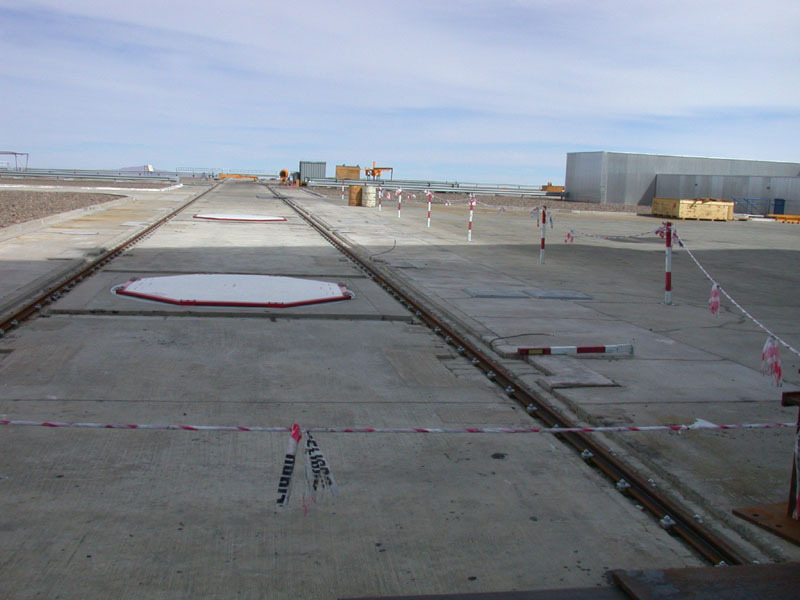 Its diameter will be about 2.5 meters and it will be added to the four giant VLT telescopes. Living quarters of employers. 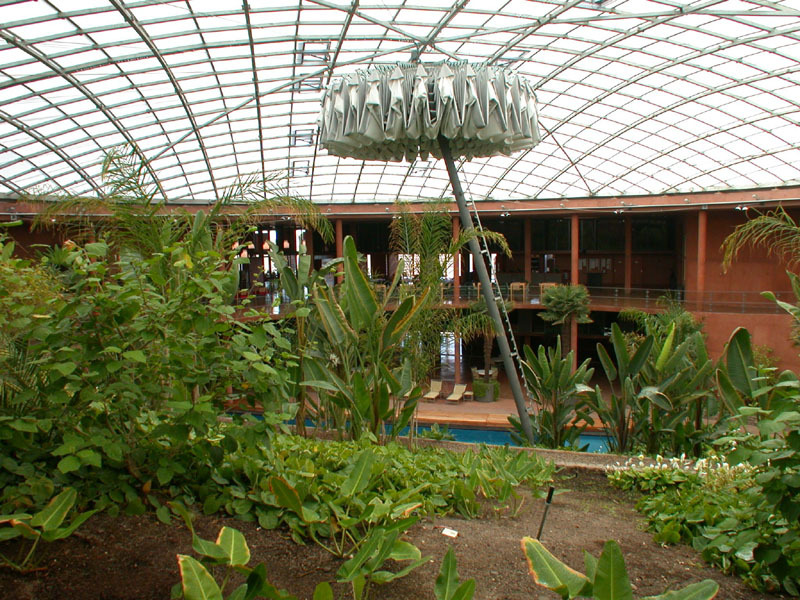 The thing under the roof is retractable blind to avoid a light pollution. 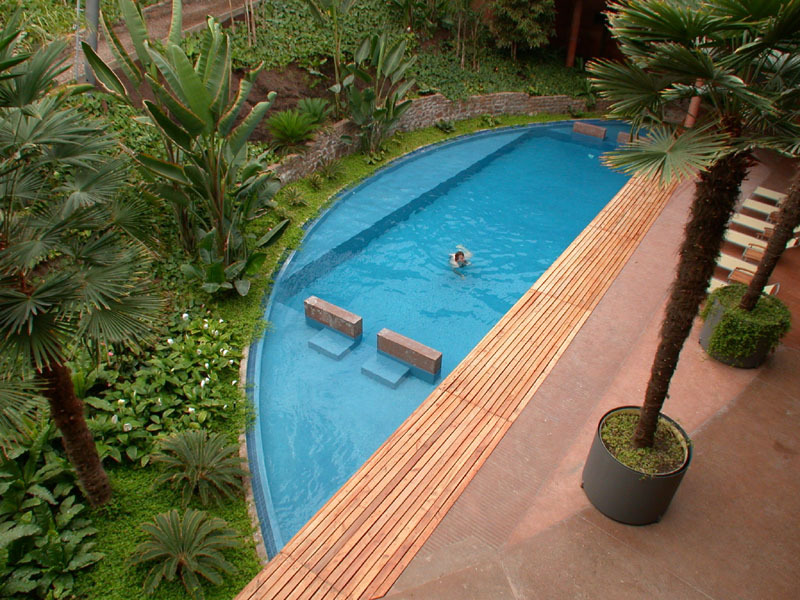 There is swimming pool, bar and lodging houses. 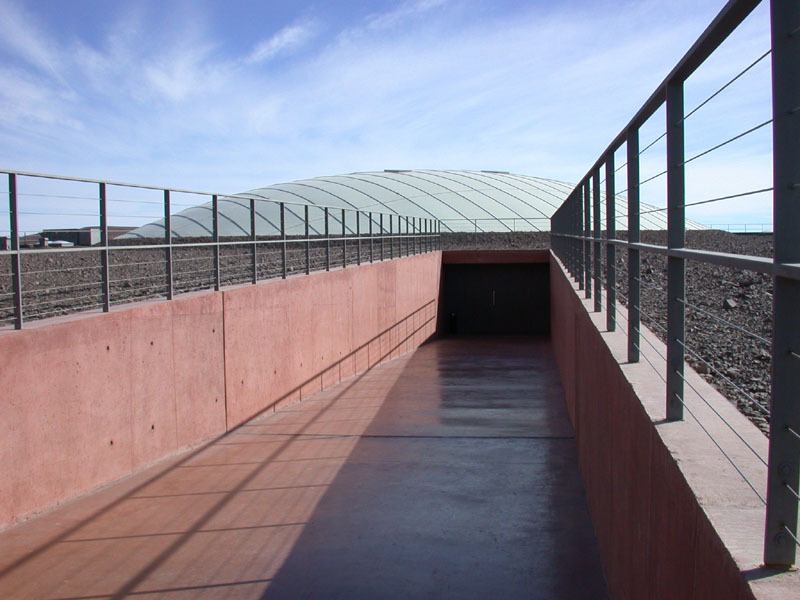 Whole facility is underground, just the perspex dome peeps from the desert. View to the ceiling and bar in background. And look at the living quarters. 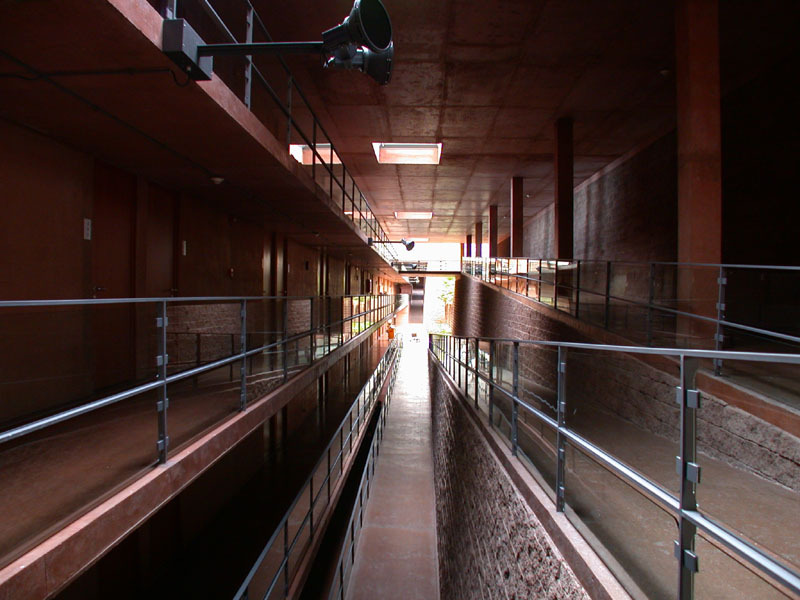 The entry to the living facility. 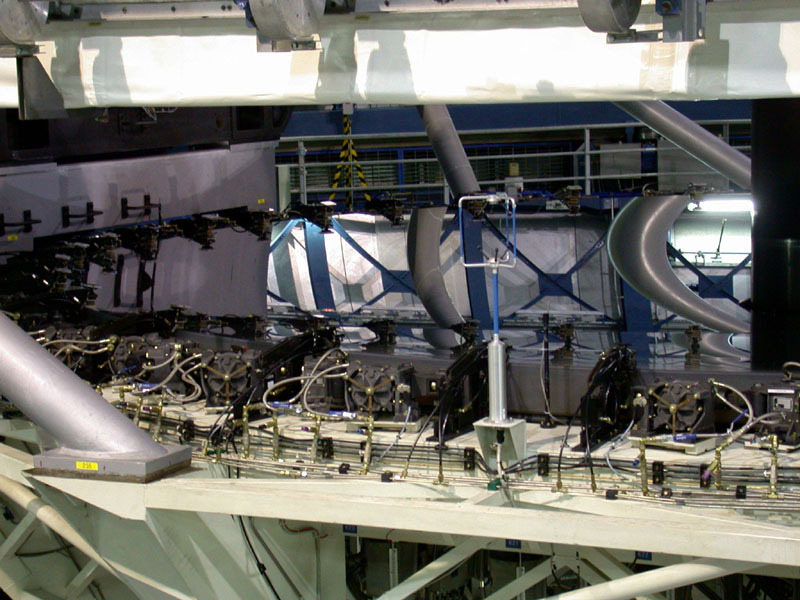 View at the vacuum chamber, where the mirrors are coated with metallic layer every 18 month. Behind the facility there are three oil powerhouses. The water is delivered daily in giant tanks. At the entry is written „Welcome“ in all languages of ESO member countries, including the flags. The Czech one is unfortunately missing. 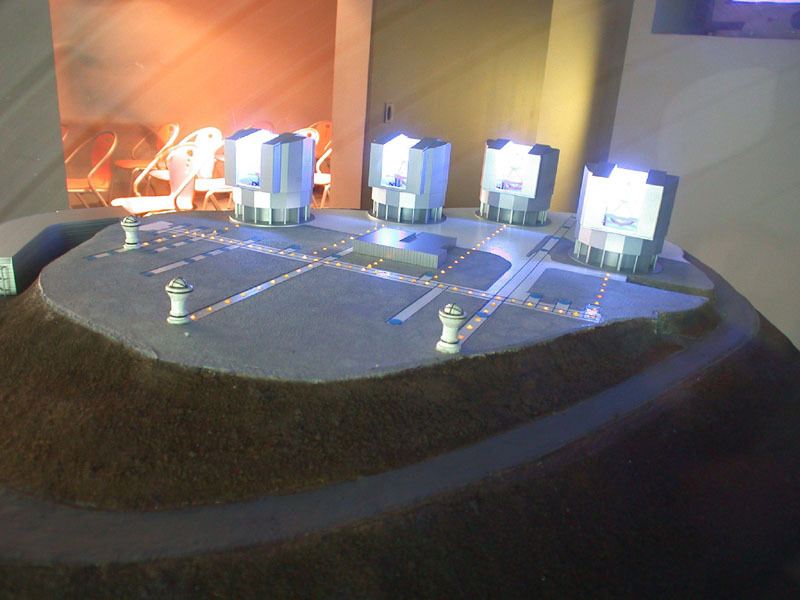 A small model of VLT as interferometer. 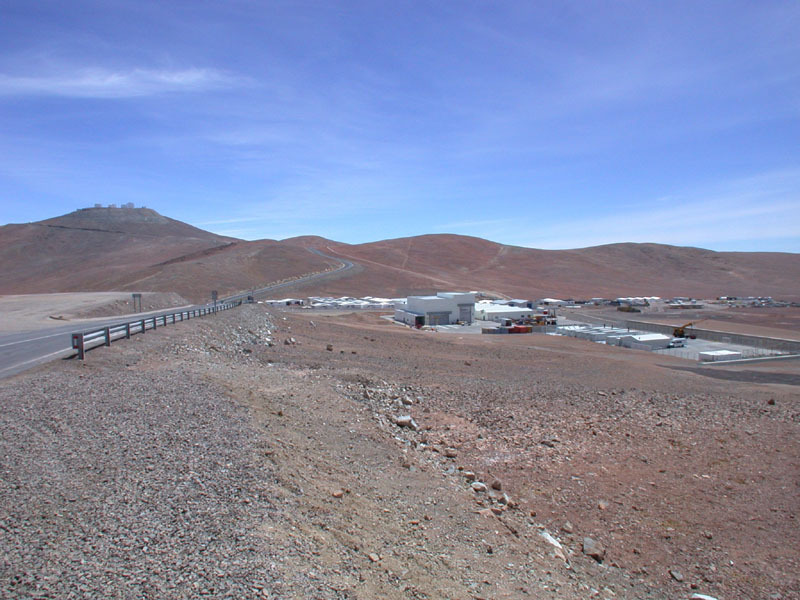 Four giant telescopes and three assistant telescopes will be linked to one interferometer with 200 m base.